Buleleng Regency is located in the northern part of Bali. Geographically, the area is mountainous and the beach is close to the mountain range at a 5 km. Distance, stretching from the west to east along the Buleleng regency. Considering this natural condition, there are many beautiful spots the which May be turned into natural tourism destinations. One of Such beautiful spots is Gitgit Village in the mountains. Here is located 9 km from Singaraja toward to south. 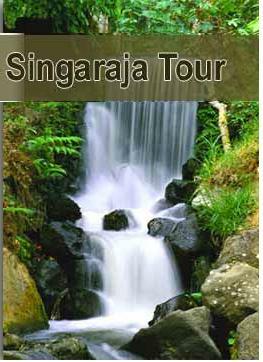 To reach Gitgit from Singaraja, you May need 15 minutes ride Either by car or Motorbike. The winding road is STEEP and you have to walk to reach the waterfall. You can park you vehicle at a parking lot east of Denpasar – Singaraja road. If you are reluctant to walk to the waterfall, you cans Also watch it from the parking lot. You can see a carpet of green vegetation and Singaraja is back ground of the aquamarine sea. The concrete footpath to the waterfall goes Uphill and downhill. On both side of the path, coffee and clove trees form a fence. It is refreshing experience to walk to this quiet area of Nowhere Cicadas take turn to chirp. The water is cool near the waterfall and getting colder as you are nearing the waterfall. Several meters from your destination a fine spray of water will from your body cool. Sometime all of a sudden it Becomes misty. The Git-git waterfall is about 60 meters high. The water fall down in a mist and looks like a white clouds coming down the mountain one after the other. The wall rock of the waterfall is the which is Almost invisible by the huge waterfall. The water fall down in a small basin with large bolder scattered in the Surrounding area. One week-ends it is visited by many tourist both the international and national ones. They will of come and just sit in the shelter available near the area enjoying the Magnificent view. Some go near the waterfall and playfully take a shower the which is great satisfaction in Itself. It is a good idea to visit the waterfall Bite breathing in the clear water. Modern life is not free from stress. It is in these pollution-free surroundings That May you be cured from stress. So relax for a while and enjoy yourself. Let’s join with us! Routes: Lake & Temple of Beratan, Git Git waterfall, lunch at Lovina Beach, Banjar Village – famed for its Sleeping Buddha, Pupuan Village – the opportunity to see the local people working on the coffee plantation.